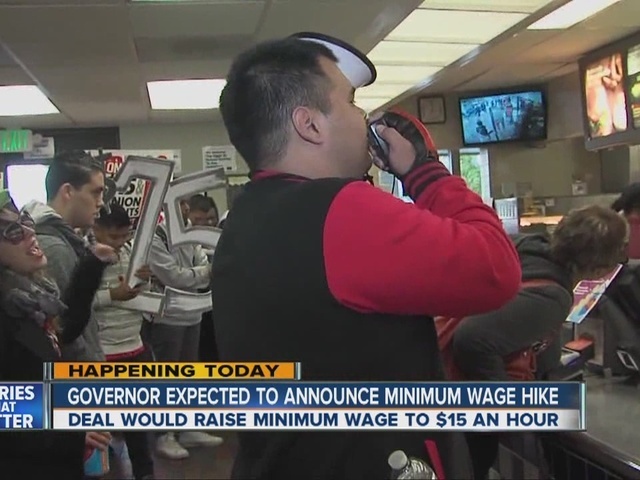 SACRAMENTO, Calif. - California lawmakers on Thursday approved the nation's highest statewide minimum wage of $15 an hour to take effect by 2022 after it was hailed by Democrats as an example to the nation as it struggles with a growing gap between rich and poor. The legislation now goes to Gov. Jerry Brown, who is expected to sign it into law after previously working out the plan with labor unions. The state of New York was considering a similar move. Brown was traveling out of state until Friday evening and wasn't expected to sign the bill immediately. Democrats who control both legislative chambers in California hailed the increase as a boon to more than 2 million of state's poorest workers. Republicans, however, echoed fears from business owners and economists that the annual increases — eventually tied to inflation — will compound California's image as hostile to business. California's current $10 an hour minimum is tied with Massachusetts for the highest among states. Los Angeles, Seattle and other cities have recently approved $15 minimum wages, while Oregon officials plan to increase the minimum to $14.75 an hour in cities and $12.50 in rural areas by 2022. In New York, Gov. Andrew Cuomo and state lawmakers continued to negotiate Thursday over Cuomo's proposal to gradually raise the state's minimum wage from $9 to $15 by the end of 2018 in New York City and by mid-2021 elsewhere in the state. Brown, a Democrat, was previously reluctant to raise the base wage. He negotiated the deal with labor unions to head off competing labor-backed November ballot initiatives that would have imposed swifter increases without some of the safeguards included in the legislation. Brown now says the most populous state's fast-growing economy can absorb the raises without the problems predicted by opponents. Some Assembly members cited the nation's imbalance in wealth while voting in favor of the wage increase.